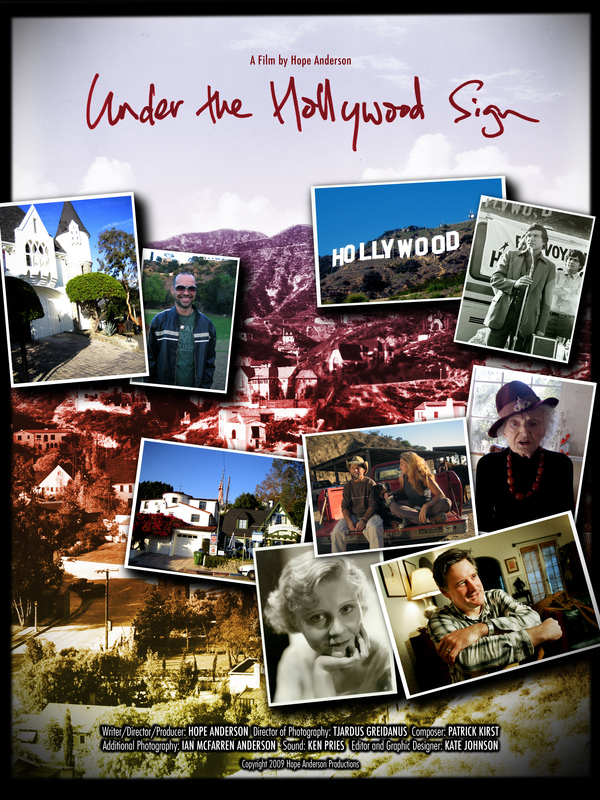 This week marks the tenth anniversary of this blog, which I started to promote my third documentary feature film, Under the Hollywood Sign. At that point, UTHS was in post-production, and my editor Kate Johnson and I were shaping scores of interviews, around eighty hours of footage and hundreds of archival images into a cultural history of Beachwood Canyon. Wanting to explore the film’s many topics in greater depth, I wrote about the Theosophists, film stars and oddball characters who populated the Canyon in the early 20th century. 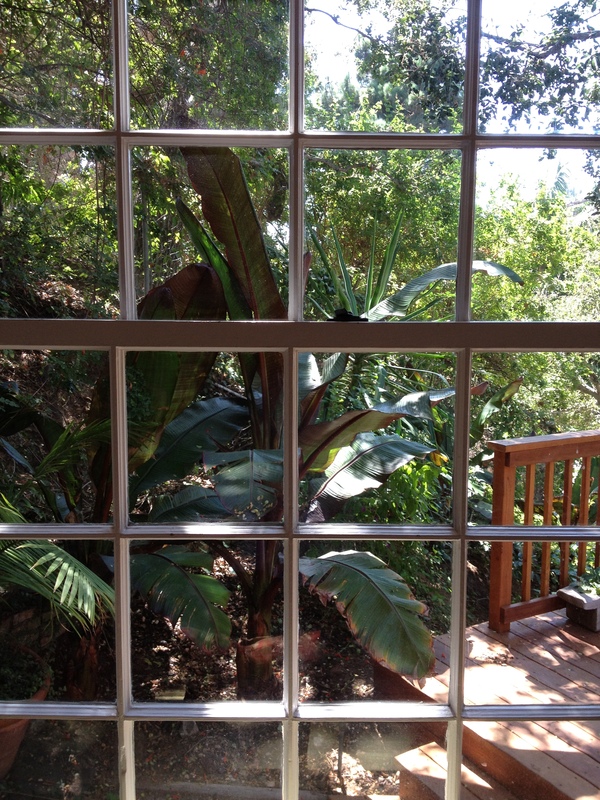 I described Beachwood’s natural beauty and wildlife, and the California holly that blooms in the hills each December. I detailed the creation of Hollywoodland, California’s oldest hillside planned community, from its granite walls, gates and stairs to its most famous features: the Hollywood Sign and Lake Hollywood. After exhausting Beachwood Canyon’s history, I moved on to present-day matters. By then neighborhood was becoming a mecca for GPS-guided tourism, and between 2010 and 2015 the number of visitors in search of the Hollywood Sign surged. Crowds overwhelmed the narrow streets, eroded the trails and drove the wildlife back into Griffith Park. Hollywoodland’s narrow streets, tricky to navigate in the best conditions, became chaotic and frequently gridlocked. Until permit parking was instituted a couple of years ago, residents were frequently trapped in or out of their houses by vehicular and pedestrian traffic that also blocked emergency vehicles. Writing about these issues brought me a slew of hostile comments, the gist of which was our right to use your neighborhood for recreation trumps your right to live here. Long after I stopped writing about local issues, angry and even threatening letters continued to roll in. These days I write mostly about film–not mine but other people’s. I also write about Japan, where I grew up and whose history and culture I’ve studied for most of my life. As for documentary filmmaking, I’ve stopped. I’ll explain why in my next post. 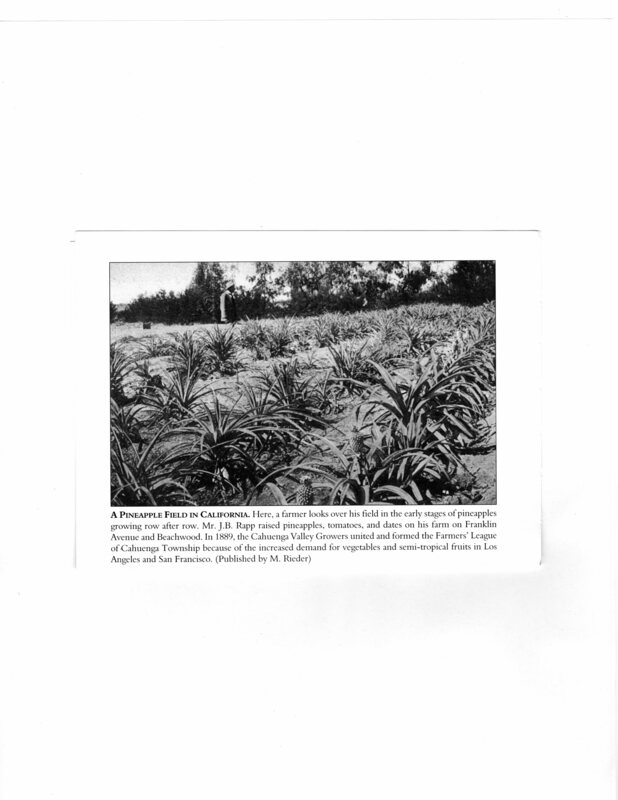 Last October I wrote about Beachwood Canyon’s early 20th century fame as a producer of bananas, avocados and pineapples. (https://underthehollywoodsign.wordpress.com/2011/10/04/bananas-of-beachwood-canyon-and-los-feliz/) J.B. Rapp’s Farm, located near Franklin Avenue and Gower Street, was the first place in the continental United States to produce such exotic crops commercially, and there is no reason to it wouldn’t have continued to do so if land values had stayed low. But Hollywood’s rapid transformation–first into a garden suburb of Los Angeles, then the center of the movie industry–caused land values to rise dramatically after 1900. 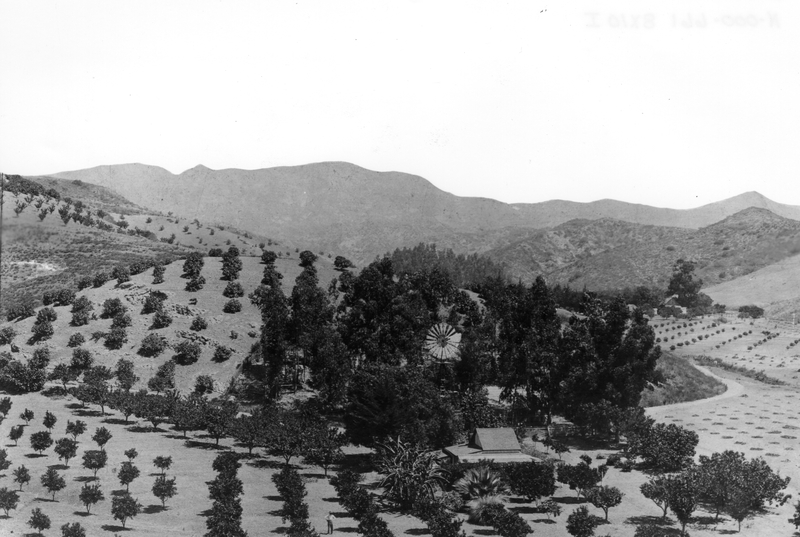 By 1920, Hollywood was a city, its recent agrarian history remembered mainly in old photographs of farms and orchards, and by its street names–Orange Grove, Lemon Grove, Cherimoya and Tamarind. 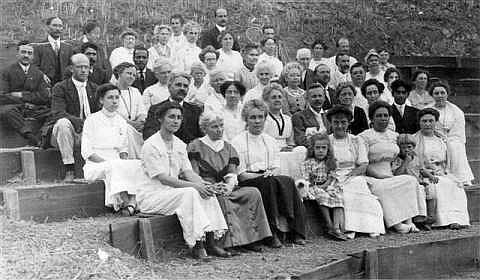 For the Theosophical Society, Beachwood Canyon’s mild, frost-free climate was the deciding factor in its relocation here in 1911. The Theosophists wanted nothing less than to create a new Garden of Eden, and their colony, Krotona, was dotted with gardens. 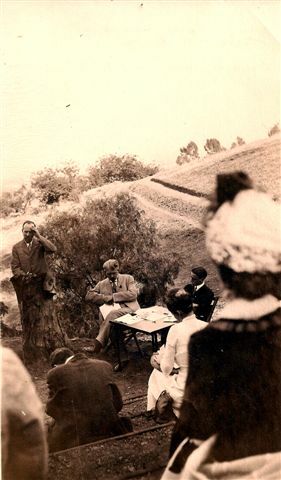 After the Theosophists moved to Ojai in 1926, their gardens became houses, forgotten except for a map and a few photographs. 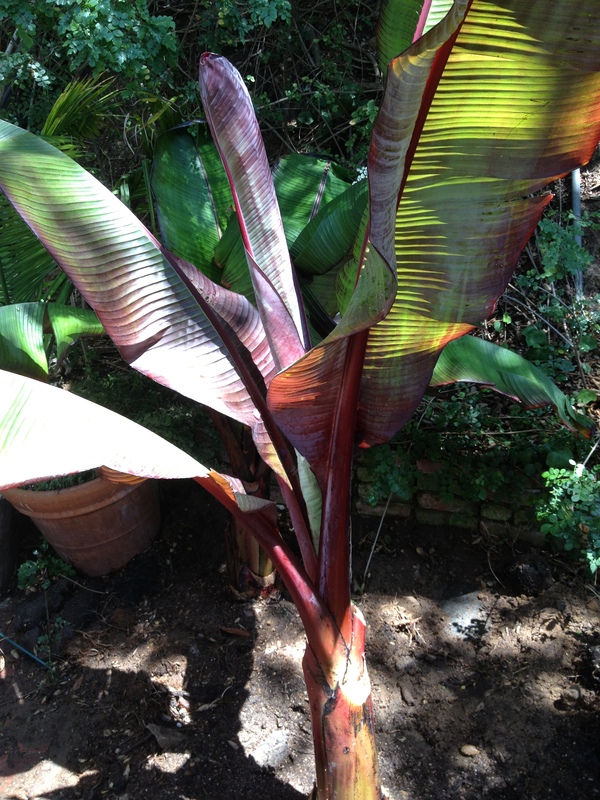 Recently I decided that my living room needed a better view, so I planted four banana trees with red-green fronds outside. They instantly provided shade, color and movement, transforming the house as well as the hillside on which they were planted. Watching the fronds wave gracefully in the breeze has been a respite for me in an otherwise vacationless summer. Because I was focused on appearance, I chose trees that produce a flower but no edible fruit. But my next purchase will be a fruiting banana–if possible the Lacatan, which produces small, creamy-textured bananas with red skins. (I don’t like the Cavendish, the yellow banana that has been the world’s commercial crop since the 1930s, but know it will grow in Southern California.) In time, I hope to have a small grove of banana trees–a living reminder of what the Canyon once was. First among them is Charles Entwistle. After the actress Peg Entwistle’s suicide off the Sign in 1932, her adoptive parents–her paternal Uncle Charles and his wife Jane–remained in their house, which still stands, at 2428 N. Beachwood Drive. In 1940, Charles was 75; Jane was 55. Both were retired from their acting careers, listing no occupation or income on the Census. The other resident of the house was their younger nephew Robert Entwistle. 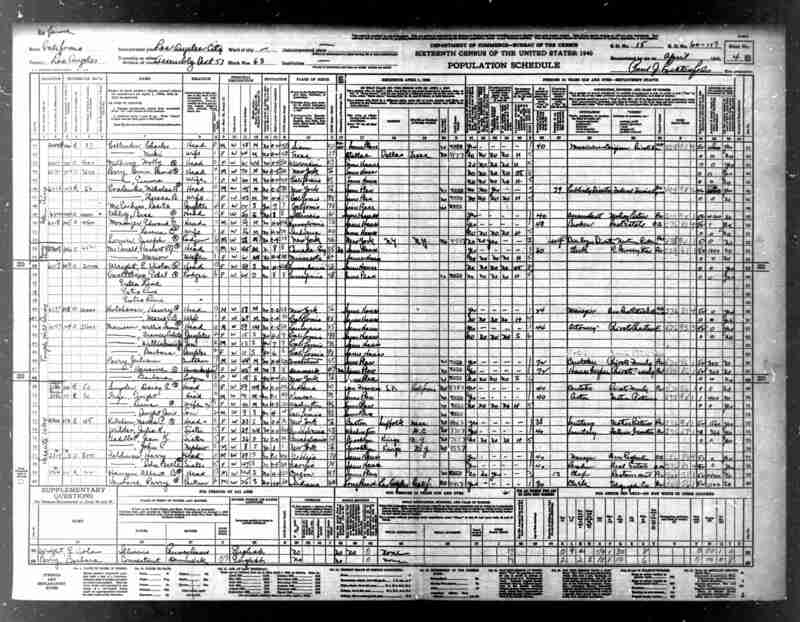 At 21, he was working as a bookkeeper in a bank and earning $898 annually, $14,758 in today’s terms. 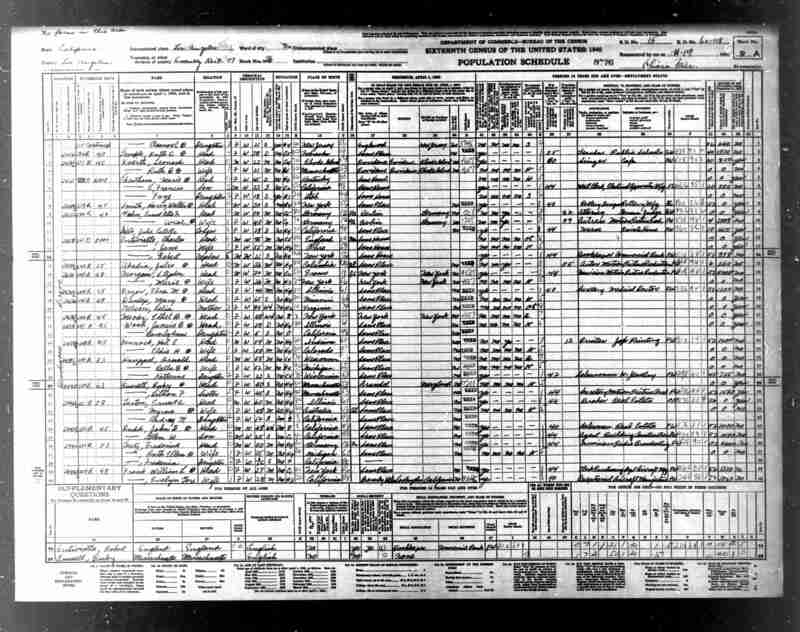 His older brother Milt was not listed; at 23 he had left the household, possibly for the Navy, in which he served during WWII. A half-mile southwest of the Entwistles lived the Theosophists Henry Hotchenor, aged 58, and his wife Marie, aged 69, at 6139 Temple Hill Drive. Marie Russak Hotchenor, the architect of Moorcrest, also designed their Moorish-Spanish stucco house, which stands directly across the street from Moorcrest. Interestingly, Henry listed his occupation as “manager of own real estate,” while Marie claimed no occupation. Finally Albert Kothe, caretaker of the Hollywood Sign and Wolf’s Lair, appears at the address where he lived from the mid-1920s until about 1960, when his dwelling was torn down: 3200 N. Beachwood Drive. His home, a foreman’s cabin dating from the days when Hollywoodland’s stone masons lived in tents on the property (1923-1925)–was located at the northern edge of Beachwood Drive, where the dirt road to Sunset Ranch begins. 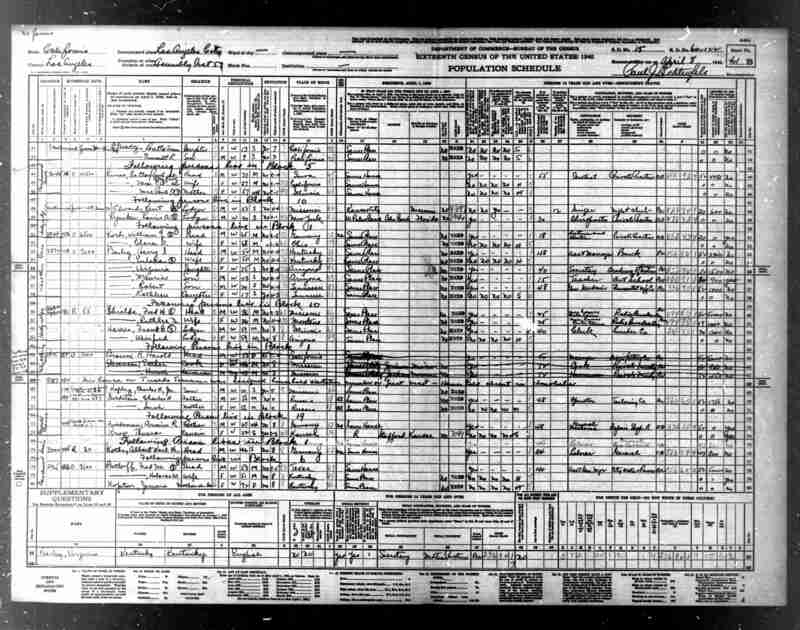 The certainty of his address should lay to rest the enduring myth that Kothe “lived in a shack behind the Hollywood Sign.” In the Census, Kothe listed his occupation as laborer for a private employer; he earned $800 a year ($13,148 today). Background information about the Entwistles, Hotechenors and Mr. Kothe can be found in previous posts. The name refers to the tract’s former incarnation as the farm of J.B. Rapp. (See photo below.) He began as a lemon grower but expanded into more exotic fruits–dates, avocados and pineapples, among others. Although it is likely that these fruits had their origins on local ranchos, Rapp was among the first to grow them commercially. At a time when oranges and lemons were rare delicacies for most Americans, pineapples and avocados must have caused a sensation. We can make the spot a veritable Garden of Eden, because….the region we have chosen happens to be one of those rare spots that are [sic] absolutely frostless, and so we can raise anything…. Unbeknownst to Warrington, Beachwood also boasted thin soil and an abundance of produce-devouring wildlife. This may explain the fact that the Krotona Colony’s map shows several ornamental gardens and a decided lack of farm plots. As a resident whose efforts to grow vegetables have been thwarted by squirrels and tree rats, I sympathize. You are currently browsing the Theosophy category at Under the Hollywood Sign.